DashCANc | CSM Products, Inc. Transmission of measured values to the display via CAN. Thanks to the 14-segment LED indicator, the displays are easy-to-read even under difficult lighting conditions. The display can thereby show two freely selectable measured values of a LambdaCANc, NOxCAN or NH3 exhaust gas measurement module. All display settings can be made via the easy-to-use display menu. 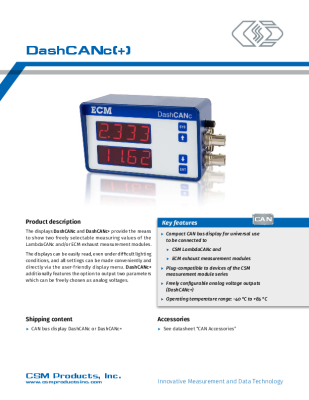 Display version DashCANc+ can also output two freely selectable measured values as analog voltages.